Mark Snyder is Associate Professor in the Visual Communication Design program at the Hartford Art School, University of Hartford, and runs the design consultancy object|resonance with partner Kevin Sepe. Snyder studied Graphic Design and Textile Design at Miami University in Oxford, Ohio — and after earning his BFA, moved to Dalton, Georgia to work for Shaw Industries Inc., a fortune 500 corporation and the world’s largest producer of carpets. He stayed there for seven years, first as a designer/stylist in R&D and then as an art director/creative director in the Corporate Communications Department. In the summer of 1992, he exited the corporate world to pursue an MFA in Graphic Design at the Rhode Island School of Design. There his thesis research was directed toward the creation of interactive environments, non-linear narrative, and multi-sensory installation. In the fall of 1994, Snyder accepted a tenure track position at The Hartford Art School — and has been teaching there ever since. CC: When did you decide you wanted to teach? MS: I knew in my Foundations year at Miami that I wanted to teach. At that time, Tom Gilmore — the remarkable professor of my first 2D design class — become my mentor. I talked with Tom about how to go about my goal of teaching. His advice: graduate with a strong portfolio, get valuable real world work experience, then get into the best graduate program possible to earn an MFA — the academic credential desired by most academic institutions for professors of Studio Art. How did you go about choosing RISD as your graduate school? After my seven years in the “real world,” I applied to the three top design graduate programs in the states: RISD, Yale and Cranbrook. I earned interviews at all three institutions. I removed myself from the Cranbrook pool — after my interview, I felt I was just not “cool” enough for that program. The Yale interview was tough — Shiela Levrant De Bretteville was great and Michael Rock was the tough one. This really pointed out to me the difference in intellectual rigor between the “real world” and graduate studies. The RISD interview went well and I really felt good about the whole Providence vibe. And Tom Gilmore was an alumni, so that the program was always in the back of my mind. It was a remarkable two years working with some of the finest advisors I could have ever hoped for. I was able to TA my first semester, then teach each Wintersession, and all remaining semesters following my first, including the summer after my graduation. I feel the two years of my MFA at RISD were invaluable. I had the opportunity to slow down in the making aspects of design, read more critical theory, explore the benefits of a rich research based process and finally to serve as a TA or co-teacher with some of the best design faculty in the country. It was a two year treat to myself, funded in part through a 401K and lots of credit card debt. Was going into teaching it in any way a reaction to being “in the workforce” or wanting to escape it? I think going to grad school and/or going into teaching to “run away” from the real world is totally the wrong reason for a career change. Increasingly, grad programs are screening out folks who apply whom they perceive are following that trajectory. I do have to say, though, that my worst day in academia has never come close to my worst at the Fortune 500 Company. So then you set about to look for a job, with MFA in hand? On top of writing my thesis and mounting a thesis exhibition, I also managed to apply for teaching positions at several institutions across the US. I ended up interviewing at University of Oregon in Eugene, SUNY New Paltz and at the Hartford Art School. The art school in particular was due to a RISD professor, Krysztof Lenk, who had a Polish design connection to the Hartford Art School through his friend Jan Kubasiewicz. The interviews went well and it was between New Paltz and HAS — but I just felt so at home with Hartford. I started in the Fall of 1994 and have been here ever since. I was tenured in 2001 and took my first sabbatical the following year. I am now the senior faculty member in the design department based on years served. I feel the two years of my MFA at RISD were invaluable. I had the opportunity to slow down in the making aspects of design, read more critical theory and explore the benefits of a rich research-based process. How would you describe the HAS VCD design program — then and now? The design program was really well established — thanks to Alex White, Jan Kubasiewicz and, before them, groundwork laid by Bill Wondriska. Their work took a loosely established Graphic Arts department and built it into a strong sequential curriculum. Over the years, the program has been advanced by some great design educators: my current longstanding colleague John Nordyke, our most senior adjuct Deb Kline (17 years) and others who have left lasting impact: Amy Gendler, Kelly Leslie, Nancy Wynn, Inga Druckrey, Chris Vermaas, Randall Swearer. Our most recent additions to the department — Natacha Poggio from Argentina and Santanu Majumdar from India — are bringing new perspectives, projects, and initiatives which are broadening our students experience and their portfolios as well. Of course the largest shift in our program, a generalist design program, is the shift in the field from print orientation toward a screen-based orientation. We are addressing that shift and looking critically at how we can still cover the basics that apply to either orientation. My colleague John Nordyke is currently spearheading revisions to our curriculum which begins with an updating of our Foundations and Sophomore year and will continue to the junior and senior curriculum. All VCD departmental faculty are participating in redefinition of courses and projects within those courses. How else does the curriculum change from year to year? Sometimes you get bored just offering the same projects year after year. We also make changes to projects based on outcomes from the previous times we have offered the project. Sometimes we retire projects because perhaps the relevance of the project, its form or its content has fallen out of currency. We often add projects due to opportunities to include some “real world” projects into a particular course. We also create new projects to address a new area that has become a part of the field of visual communication continuum. We look at trends as identified by fraternal organizations like DMI, AIGA or ICOGRADA. We have all been looking at the white paper from AIGA about the Designer of 2015 as we upgrade our curriculum and our course projects. One rather unique feature of the program is that it makes students pass a portfolio review to proceed into junior and senior years in the program. Can you explain the reasoning behind this process? We do not have a set number of students allowed into each year of the program but we do have grade standards. Each year those standards escalate. The field is so competitive — especially in our current economy — that we feel our grads need to feel the competitive nature of the field as a part of their studies. The portfolios submitted by each student also show us what the student has learned beyond the assignments, by the way each student presents their work and designs their table of contents and portfolio layout. Students seeing their colleagues cut each year also get a reinforcement that this is a competitive program and that they need to keep up their development and advancement if they want to graduate from our program. After all, all those out in the field affect our program’s reputation. Deb Kline, a longstanding adjunct who is also an alumnae, put it in a great way. She said that her role as an adjunct is to advance students and get the best work out of them, because their portfolios will reflect not only on the program but ultimately on the value of her degree as well! The program definitely teaches theory and problem-solving over teaching software in the classroom. Why is this so important? It is expected that students will be earnest about keeping up with the ever changing programs as students, which will prepare them for the rest of their life in the field. We are all constantly struggling to keep up with the latest versions of all the programs we use each and every day. It is often thought that teaching the programs is too much like continuing education orientation. As a generalist design BFA program, we offer basic demos of programs in relation to projects especially in the earlier years to acquaint students with program basics to realize our course assignments. At the advanced levels we often supplement demos with tutorials from Lynda.com or visiting guests. Again our desire is to encourage students to find sources to advance their knowledge and skills with design programs which will assist them in realizing their design vision. There is also a lot of teaching and learning that goes on between students in the design lab during classes and after hours and around the clock! How would you rank your program against other schools — in Connecticut and in the country? I might be biased, but I have had the opportunity to see the results of many programs in the state at Connecticut Art Directors Club’s Student Conferences. I am proud of our students and their portfolios, and have to say that I feel we are certainly one of the best in the state. This notion is reinforced by judges in regional and national design competitions, as well as at CADC Student Conferences, who deem our student’s work worthy of recognition. Our students fare well in the real world as well. We always encourage them to sell themselves in other markets as outside the box, say for example in NYC or LA. Their portfolios stand out in those markets as compared with portfolios from those cities’ key Design programs. Our students have done well competing in markets including Connecticut, New York, Boston, Atlanta, LA, San Francisco, and most places they go after graduation from our program. Their performance in their years after graduating also set up networking opportunities for younger alums. We have Tim Cohan, Chirag Bhakta, Laura Mango, Jen Ewaski and Hara Roset all doing well out in California, and Heather Donahue up in Seattle, just to name a few! 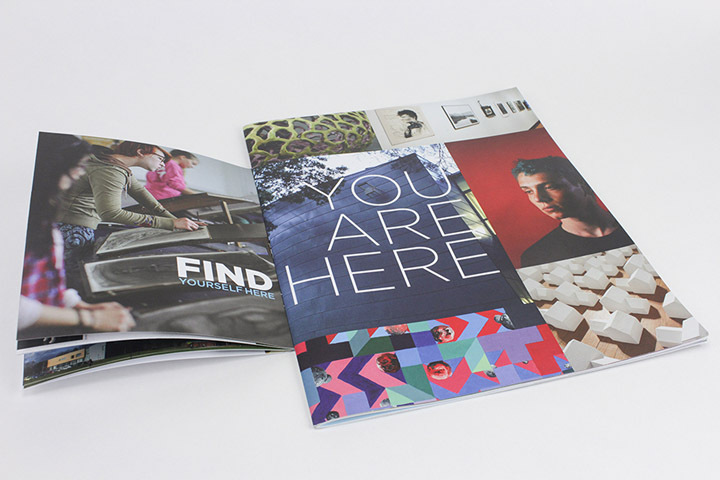 What is it like to be a commercial art program in a fine arts school? There is always a division between the fine and applied arts in academic institutions. I saw it in my undergrad institution (Miami University), at RISD and certainly here at the Hartford Art School. The actual physical divide at the Hartford Art School is further defined by the fact that the two commercial disciplines — VCD and Illustration — are physically removed from all the other fine art disciplines in the east wing of the Harry Jack Gray Center. The other disciplines are housed in The Renée Samuels Center compound and an adjacent building that houses Sculpture, Ceramics and Foundations 3D Studios. I want to make it clear that I feel our students in VCD do benefit greatly from exposure to all the fine arts disciplines and this exposure enhances the work they produce in VCD. Many of our students minor in one of the fine arts disciplines at the Art School. The judgments will always be a part of our field as long as there are individuals in who want to create hierarchies — whether it’s between fine art and design, or whether it’s amongst fine arts disciplines themselves, arguing which ones are the more pure or significant and which are secondary in importance. All designers are artists, but all artists are not designers? Maybe, could be, I guess? Do you consider keeping in touch with students after they graduate to be part of your job? Yes, absolutely. This is what my mentor Tom Gilmore did; it served as a means not only of tracking their individual successes, but also as a key in networking for each year’s graduating seniors. Alumni are our best advertisement and we cherish their ongoing contact — their visits back to the program and eventually (we hope) their participation as adjuncts, visiting critics or workshop leaders. What qualities make for an exceptional student? Passion, engagement in the subject, and in the world, curiosity are all things we look for in a great student. Conducting portfolio reviews over the last 16 years I have seen the overall quality and preparation for what is expected of a pre-collegiate portfolio improve greatly. Formally the work is stronger and it in many cases is also getting into the conceptual. We, at the Hartford Art School are not only interested in the student who shows formal and technical strengths but also in the student who is capable of defining what thoughts and processes underpin the work in their sketchbooks and portfolio. 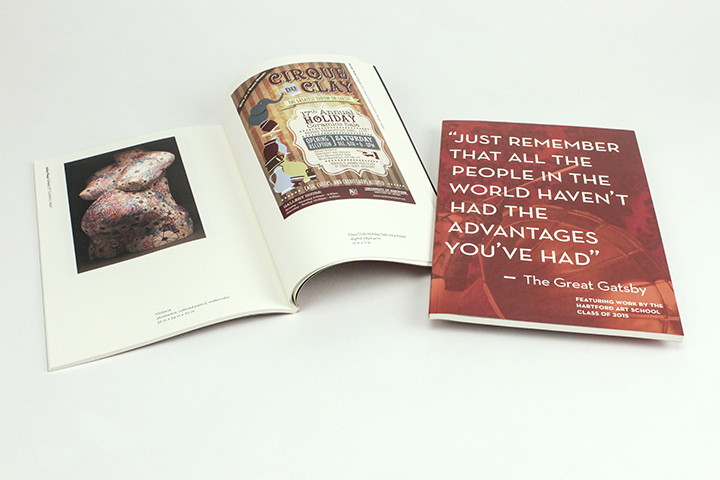 The creativity, technical capacities and editing skill are self-evident in the portfolio. We are also interested in the student’s ability to talk and writer about their work, their process and have a critical eye for everything that they make in the studio or encounter in the world. What qualities make for an exceptional teacher? It is my opinion that the best professors are student centered. The majority of my teaching experience has been within “teaching institution” not a research institution. The main difference is that in a research institution, professors are oft more engaged in their own personal research and often the teaching becomes secondary. At the Hartford Art School, University of Hartford, we are a teaching institution and although faculty are expected to have parallel careers as a strong teacher and an accomplished practitioner in the field in which we teach, our focus is always to be on the teaching aspects of our professorial appointment. Beyond the student centered focus, which I feel is crucial to being a great professor, I believe that we must also work to remain current in the direction(s) our field is heading. Updating our projects is key. This can take the form of new projects in our courses or updating and modifying projects based on market demand or programmatic relevance. I also feel finding a balance between realistic projects with real world constraints and a few poetic projects that run in the designer-as-author vein is truly important. Also mixing up the subject matter or content of projects. Since we are a generalist program so it would be ridiculous to do only packaging, or only advertising or to address only sustainability or other timely or trendy social issues, on the content side. Can you be a bad designer but a good design professor? I do not really think so. Such a big part of your career is spent making work, which will be out there in the world for your students to see. It would be hard to do poorly designed work and be able to maintain your teaching position. There are certainly times when you question your work and it is not totally uncommon to find students who you feel are producing work that might eclipse your own work. Rather that seeing that as threatening I look at it as a learning experience for me! I can think of many students and alums whose pieces I look at and say wow, this is amazing or I wish I would have done that! What do you think of “self-taught” designers — with either no training or with a fine arts degree outside of design? There are many people out there who exemplify the self-taught model and I respect some of their work. I would have to say one of the best creative directors I had the opportunity to work for — at Shaw Industries and later at ie:design — was Bill Grant, former AIGA national president. He was an English major, and the brightest creative director I have ever had the opportunity worked with. As long as the work is strong from an image and typography standpoint I have no issue with the self-taught model. I do take issue if it is not fully backed up with quality. Today everyone who has a computer fancies themselves a designer — just as many feel, with a digital camera in hand, that they are a photographer! I advocate for quality; that we let trained photographers do their professional work, and that clients will hopefully hire trained designers to do important work — rather than a niece who has a Mac and an “eye for good design.” Unfortunately sometimes the untrained niece gets the job, and usually the work produced is less than quality, and often ineffective. I had the opportunity to be the guest of Amid Capeci, an HAS Alum (83) who recently received the Anchor Award from the University of Hartford. He, like many successful alums, went to the Art School at a time before we had a well-defined Graphic Design program. In his acceptance speech, he noted the importance and value in a 21st Century marketplace to be able to rely on hand skills of drawing and concepting, which were learned in those foundational years at the art school. You can always learn the newest technological tools, but what is key is to be nimble of mind and of hand to be able to communicate your concepts for colleagues and clients. He is currently the design director for Entertainment Weekly, and before that Managing editor of Newsweek. Before that he held design positions with Rolling Stone, Esquire and Travel Holiday. What holds more weight with you in a student, raw talent or hard work? I do not see one as better than the other…I guess I want both. I hate to get a student with natural talent who is just plain lazy. To me that is unacceptable. There are many students from my past that struggled and worked so hard — and “got it” late in their career as a student. It’s when you witness that lightbulb go off that’s amazing. Sometimes it happens in the junior year, and for a few in the senior year. Sometimes you are holding your breath right up until the senior portfolio review, where hopefully you can breathe a sigh of relief — for that one student who you have been advocating for, who finally, in the eleventh hour, has that design “eureka” moment. Tell us about how object|resonance came about. After my first semester of teaching at HAS, the Dean Stuart Schar sat me down and asked me to create a plan for how I would achieve tenure. In the spring of 1995 the business plan for object|resonance was created. After leaving the Fortune 500 world, I swore to myself that I would make every effort possible to work for non-profits and those who thought they could not afford professional design. 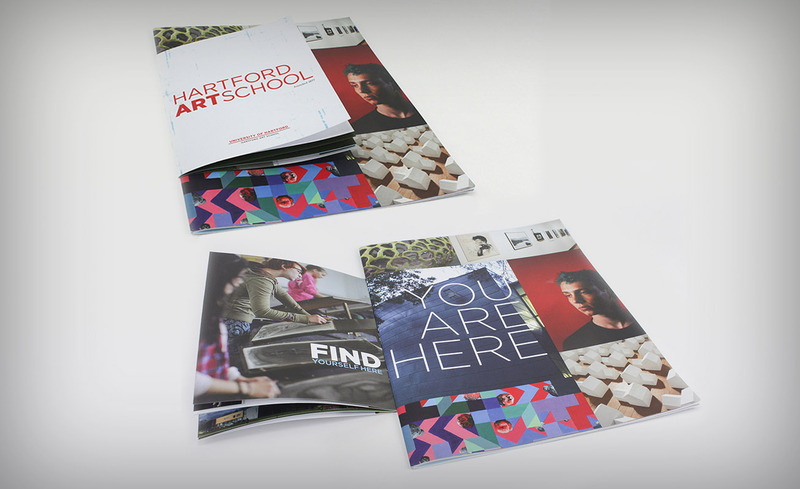 My first client was Hartford College for Women. I created a series of newspaper ads for them, promoting their programs for non-traditionally aged female learners. The goal for my studio was to work for non- and not-for-profits, and over the years our niche within that market has become education, and the fine and performing arts. Our clients have included: The Hartford Art School, The Hartt School and Hartt Community Division, The University of Hartford, Trinity College, Columbia University, The Painting Center, The Drawing Center, The Hartford Stage, The Wadsworth Atheneum, The New Britain Museum of American Art, The Joseloff Gallery and the Widener Gallery — just to name a few. In 1999, a former student and HAS VCD Technician, Kevin Sepe, became my business partner — and we have been working together ever since. Traditionally every two years we take on a student intern (or two) to assist us with a heavier workload during the summer months. Many of our interns have gone on to some great positions. Kyle Nelson at JDK and now at Clifford Stoltz; Troy Monroe at co:lab and current CADC president; Rick Orlosky, at the Bronx Zoo, Eric Godard, at ESPN; Brendan Sullivan, Cronin & Co; Matthew Hunsberger, at Humongo; and most recently Tomasz Kazmierczek, at How 2 Design. We also had HAS Alum Todd Timney work with us for about two years as well. All of these individuals have had a resonant effect on our work and on our client’s look and messaging. Our portfolio is richer for having each of them working with us! Over the years we have made connections in the community where we work and where we live and find ourselves doing pro-bono work for some of our regular clients and for organizations we strongly believe in. These have included: Act Like You Care — a collaboration between Miss Porters School Art Students and middle/high school students in Hartford’s West End. We worked with the Upper Albany Avenue Main Street program’s First Fundraising Gala. And for the last six years we have been the designers for The Maxwell Shepherd Memorial Arts Fund, Inc. This is a Collinsville, Conn.-based organization that supports fine and performing arts events in the area. 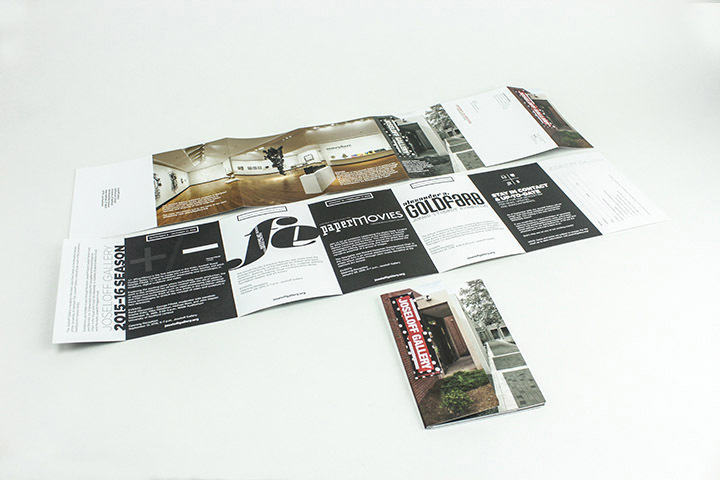 The fund sponsors 4-6 concert events during a given year and often one or more gallery-based events including exhibitions, workshops and lectures. We truly believe in the mission and the programming of this organization which produces all of these events free of charge to anyone who would like to attend! Of course, over the years we have done a great deal of pro-bono work for the CADC as a board member and as its president. What are the pros and cons of being a practicing designer vs. being an educator? For most of us in tenured positions or tenure track positions, we have to do both. In addition to our teaching and service responsibilities, we are required to maintain a parallel career — as a producing designer whose work is recognized in competitions, or a writer/researcher who lectures and publishes on subjects related to design or pedagogy. So, if you are looking to escape the “real world” and jump into a career as a college professor, you need to be ready to have dual careers. That being said, we do have a great schedule. It is possible for a professor at our school to teach all of your courses in just two days a week. We always have service and committee work during the week, but often that can fit into the two days you are teaching. We have two 16-week semesters — with three months off in the summer, a month off for winter break and a week in March for Spring Break. (Woo-hoo! A 47 year old who still gets a Spring Break!) This does leave lots of time for research and running one’s studio. You mentioned the work object | resonance has done for the Connecticut Art Directors Club. Tell us more about your individual involvement in the Club. I have to say I joined because I knew it would look good on my CV for tenure — but then I became hooked. I especially like the opportunities for us to co-sponsor events between HAS and CADC. Certainly our students have benefitted from the Student Conferences often hosted on our campus. The contacts I have made by being on the board also provide great opportunities for our graduating students to network as well. What are some of your heroes and influences in design and education? That changes over time but some remain constant. I have always loved April Greiman who has always embraced the newest technologies in our field. Josef Müller-Brockmann for those amazing posters. Dutch Artist / designer Hendrik Werkman for his experimental typography. Tibor Kalman for his wit and experimentation with typography and the book format. And finally Charles and Ray Eames, for their embrace of all that surrounds ones life and their weaving of a strong sense of design and quality in every aspect of their career and life. As far as educators go from my undergraduate education my mentor Tom Gilmore as well as two great design faculty Joseph Cox and Thomas Effler. Effler and Cox were strongly influenced by their Swiss training at the University of Cincinnati and brought that influence to our classroom experience. During my time in Georgia a very wise man, and consultant Travis Rhodes, taught me about simplicity and form through the ceramic work of Charles Counts. At RISD there were so many amazing faculty and visiting artists and designers. Grad program founder Tom Ockerse, and graduate faculty Sharon Poggenpohl, Jan Van Toorn, and Hammett Nurosi were all strong influences. Others whom I worked and studies with include Jan Baker, Janet Zweig, Chris Vermaas, and Krzystof Lenk. All were so generous in opening up our eyes and minds to new information as well as letting us observe them as amazing design educators. Here at HAS I have looked to senior faculty as mentors and they have included Fred Wessel, Peter McLean, Chris Horton, and Mary Frey. Former Dean Stuart Schar was also is someone who I greatly respect as an educational administrator. Part businessman and part artist, he always made thoughtful decisions and suggestions which were always made keeping in mind what would benefit the mission of the Hartford Art School. He was an exceptional mentor and advocate as I moved through the tenure process. Can you pick one moment or experience that sticks out as the highlight of your career so far? One thing that I am particularly proud of ties many things I have mentioned together. During the annual award show for CADC at the end of my term as President, I was able to induct an amazing educator into the Hall of Fame. Paul Zelanski touched so many Connecticut creatives’ lives being a professor at UCONN from 1962–1995. He taught color, basic design and painting. His influence can be seen in so many great artists and designers who went through that program. His daughter Noemi Zelansky Kearns has a thriving design studio — How 2 Design — here in Connecticut. Paul has been a visiting lecturer and professor at the Hartford Art School. He taught a design class in color for our students as a part of the William Wondriska Master Class Fund. I was so pleased to be able to induct him into the CADC Hall of Fame and to recognize him for his many contributions to our field. To my knowledge the only other art/design educators in the CADC Hall of Fame are Paul Rand, William Wondriska and Susan Vial.